Hello traders. Welcome to the thiknorswim tutorial and the third module, charting. In this lesson we are going to talk about flexible grid on the thinkorswim platform. Now, you can see right here that we have one chart open on the E-mini S&P 500. Now, if you want multiple charts on your window, all you have to do is go to this square menu at the top right of your platform and click on it. Now, here you can choose to have only one chart, two charts, or you can choose four charts or whatever customization you want. You can choose up to 28 charts on your window by just highlighting every single square on your grid menu right here. Now, we are going to choose to have four charts for this demonstration. And as you can see right here, when we click on the four chart customization on this menu, we have four chart windows. Now, you can choose to have any instruments you want. For example, if we want to put right here we just type CL, let’s say that we want a EURO/USD also and the GBP/USD. This is just for demonstration purposes. 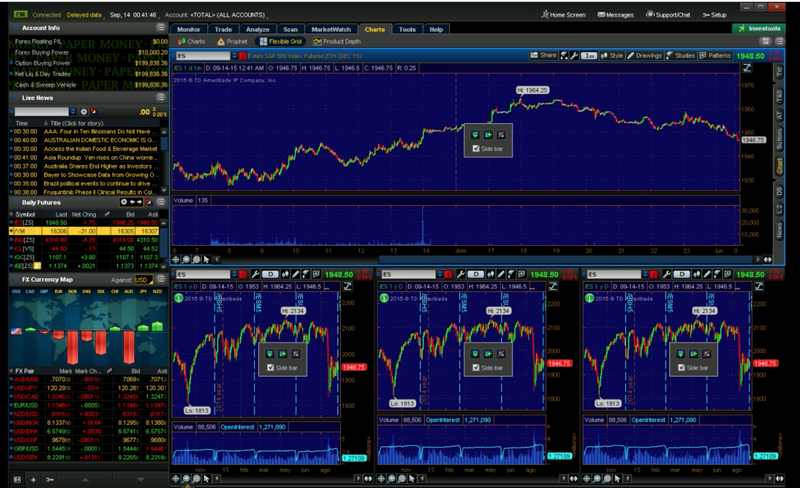 Now, you can see that we have four chart windows on this platform right now. Now, you can also see that to the right side of the instrument name we have these colored squares. Now, for example, if I want to link this three charts to the main chart that I have right here, I only choose a color right here, which is the red for example, and link these three charts to the red. So this will prompt out the same financial instrument that I’m looking on this chart on the top left side of my grid. Now, if you change for example your instrument back to the E-mini S&P 500, it will change on all of the charts that you are looking on the platform. And this is very, very helpful when you are looking for example the 1 minute chart right here and you want to look to the 50 minute chart on another sale and you want to look on the hourly this sale and the four hour chart here on the top right side of your screen for example. This is actually very important for all of you traders that use multi-time frame approach to your trading. Now, there’s another way to have multiple charts on your screen and that way is by clicking the flexible grids menu. If you click on the flexible grids menu, you can see that you can have four charts on your window but the customization of those charts is flexible. For example, right here we have one chart that is big on the top and then three smaller charts. This is also very important for example if you use the one minute chart for sending trades and the other three charts just for reference on higher time frames. Now, if you link your charts to the red or whatever color you want, you will get the same instrument on all of your charts. Now, this grid can also be customizable by clicking this squares menu right here on the top side of your trading platform and clicking on “Customize Grid.” When you click on “Customize Grid,” you will get these center squares, well these squares at the center of your charts. If you click the side bar, you will get rid or you will unable the super gadget menu. Now, let’s unable the super gadget menu on the three charts on the downside of the flexible grid. Now, if you want another chart right here, you can click on the plus sign and it will bring a new chart to the right side of your main chart. To eliminate this chart, you only have to click to on this third icon on the center square of your chart and this will eliminate any chart on the flexible grid. If you want for example a new chart on the top of these two bottom charts, you just click on the first icon and this will bring a new chart only on the bottom side of this chart. If you want a new chart on the bottom side of this main chart, you just click on the first plus sign on your center square. And by doing this you can customize your flexible grid to have as many charts as you want and position them as you want them on your trading platform.